The much anticipated Kayrock Relocation party flew off the handle. In a good way. Lots of gorgeous prints were sold. Lots of beer drunken. Lots of jokes told. Lots of jokes written. Over at Kayrock you can glimpse a handful of snapshots of a small cross section of the beautiful people crawling all over the place. Click here to be transported to that magic place. 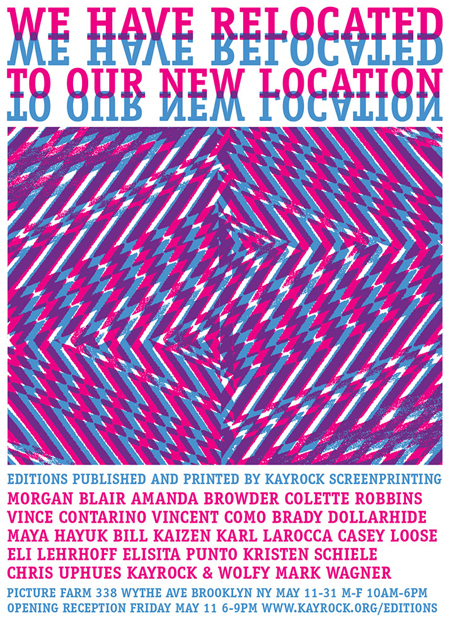 Come join us this Friday evening for a beer or a vino to celebrate “We Have Relocated To Our New Location,” a group show of fine art editions printed and published by Kayrock Screenprinting, featuring work by Morgan Blair, Amanda Browder, Colette Robbins, Vince Contarino, Vincent Como, Brady Dollarhide, Maya Hayuk, Bill Kaizen, Karl Larocca, Casey Loose, Eli Lehrhoff, Elisita, Punto, Kristen Schiele, Chris Uphues, Kayrock & Wolfy and Mark Wagner. Patterns of duality are evident in Emily Chatton’s work: frailty and strength, darkness and light, nostalgia and contemporary concerns. The misty surfaces of her paintings often resemble faded maps that seem to evaporate into our immediate environment, drawing the viewer into a vaporous world of muted colors, gossamer grays and eddying blacks. Chatton’s use of India ink recalls a sense of history, used in ancient China and India, the ink was used on scrolls to scribe histories, myths and music. 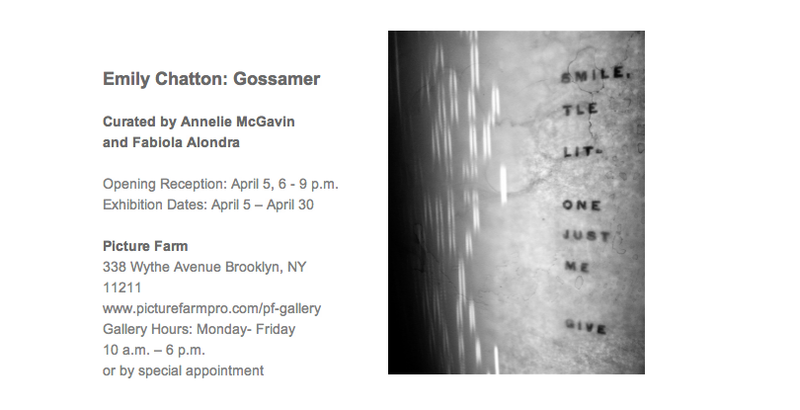 In her new body of work presented here for the first time, she transforms found player piano rolls from the 1920s using Mylar and light. For their original purpose of playing automated piano music, the rolls of Player piano or Pianola moved via a mechanism inside an upright piano which triggered the holes in the paper to play notes. Instead of the original device, Chatton uses light to animate the scrolls. The punctures allow light to enter through the scroll and diffuse onto the Mylar with diaphanous affect. 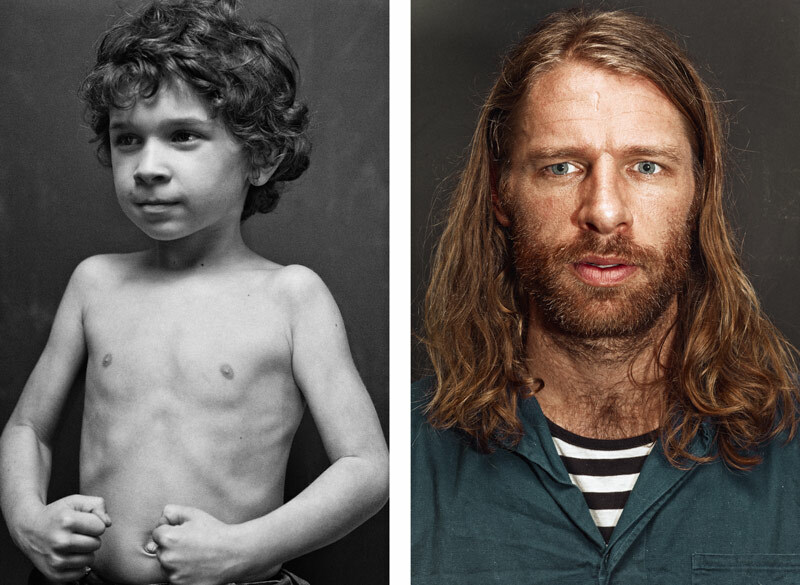 With titles such as “Lonesome and Sorry,” the lyrics are melancholic but the melodies cheerful, another dichotomy to be found in Chatton’s body of work. In the Mylar and India ink paintings, Chatton presents “landscapes” and fictional realities that blur the distinction between abstraction and the representational. These works appear delicate but the material Mylar is durable, resistant to heat and environmental pollutants. The ink’s initial reaction to the surface is also a volatile burst, creating scenes that are visually ambiguous. From a seascape inhabited by a lonely boat, to organic and susurrus forms that spontaneously develop when the ink comes into contact with the Mylar, a union of materials reminiscent of human relationships. Similar to how a gesture, a touch or a word exchanged by two beings can have an unpredictable result, Chatton’s use of materials echoes this dynamic with ephemeral results. Emily Chatton (b. 1974, London, England) studied at the Art Students League of New York and the Pennsylvania Academy of the Fine Arts before moving to Brooklyn in 2008 where she currently lives and works. 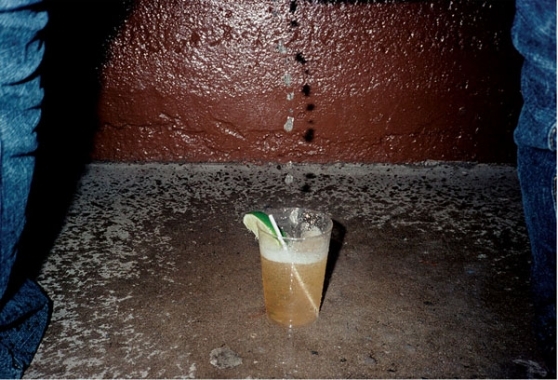 Chatton’s exhibitions and awards include Reverberations, James Oliver Gallery, Philadelphia (2012); Emily Chatton, Governor’s Island Art Fair, NYC (2011); Emily Chatton, Salon Ciel, New York (2010); Emily Chatton, Pennsylvania Academy of the Fine Arts, Philadelphia (2006); The Philadelphia Mayor’s Award (2006); The Faculty Award (2006); Cecilia Beaux Memorial Award (2004) and The Henry J Travel scholarship (2004). 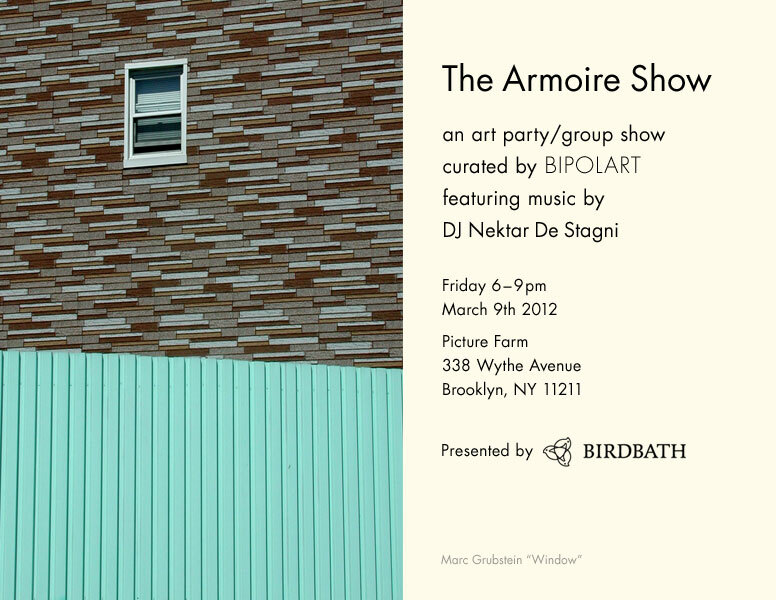 Picture Farm is proud to host “The Armoire Show” – an art party/ group show curated by BIPOLART, featuring music by DJ Nektar de Stagni + drinks. Local photographer Grant Cornett recently featured Todd and his son on his photo blog, thelivest1. The blog features a wide variety of photographs, from black and white portraiture to colorful still lifes to melancholy landscapes. 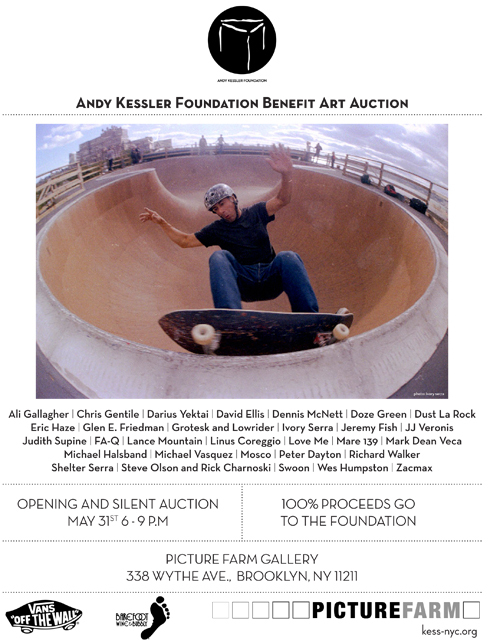 Grant is slated to have a one man mess of a show at Picture Farm in October. Our friend and local Williamsburg artist Coco Dolle stopped by today to drop off some flyers for her current project, The Art Pop-up Shop. Showcasing the work of the local art community, this show is a collection of limited edition series with reasonable sell prices ranging from $50-$1500, including collages, photographs, paintings, prints, sculptures, and art objects. This month’s showcase includes artists Damaris Drummond, Ellen Jong, Max Sanjulian and Jordan Tinker. See it this Wednesday, January 25 from 6-9 for the opening, or Friday – Sunday, 12-8 at 672 Driggs Avenue here in Williamsburg. Our friends at Ugly Art Room have done it once again. 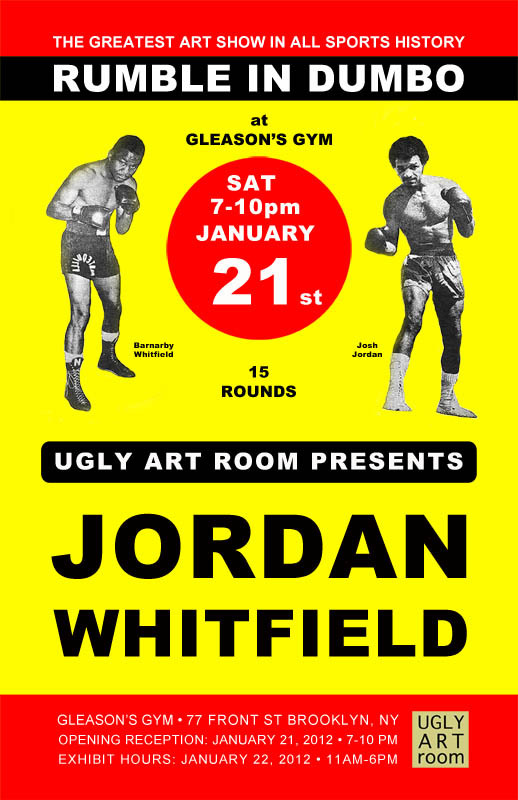 This show opens on Saturday, January 21, and is described simply as a two-painting exhibition in a boxing ring. 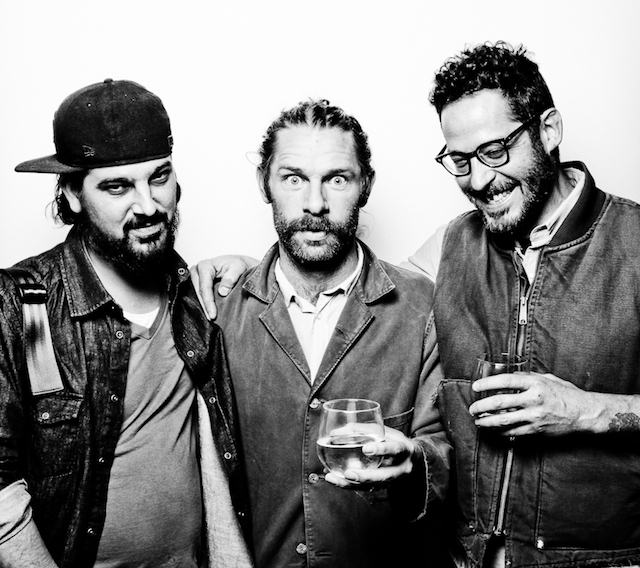 Curated by Martin Esteves, the paintings of Josh Jordan and Barnaby Whitfield face off in another untraditional art space – Gleason’s Gym. 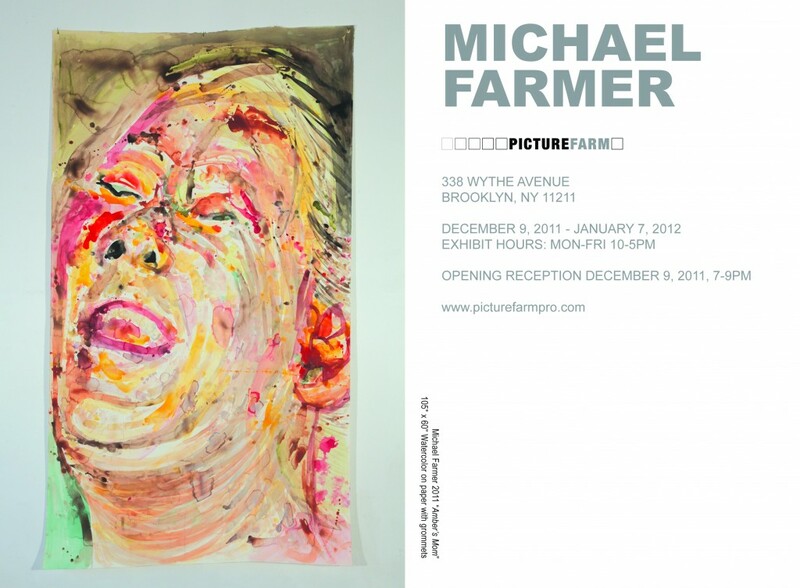 Michael Farmer’s show opens here at Picture Farm this Friday, December 9! 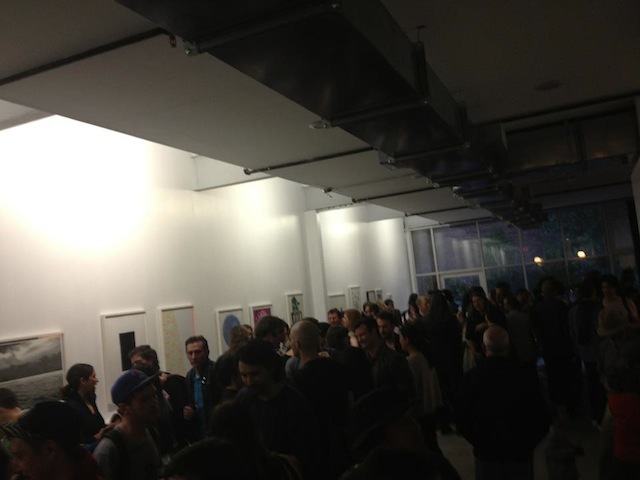 Come join us for another awesome opening.